Capuchin monkey Winslow Homer scratching himself. 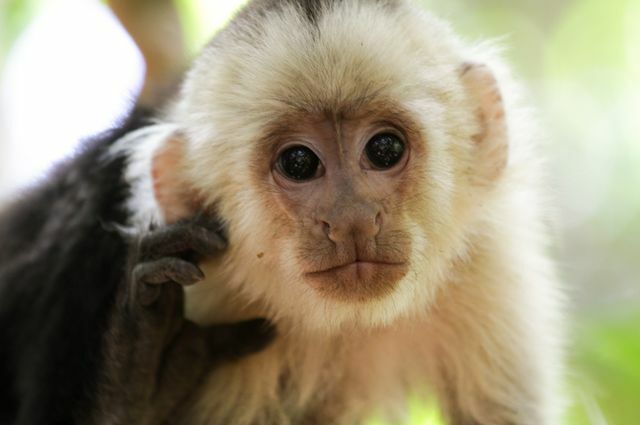 A new website called HowtoBeAMonkey.org provides a glimpse into life inside a Costa Rican tropical dry forest — both for the capuchin monkeys that call it home and the humans who observe them. UCLA anthropology professor Susan Perry has been working with teams of students and volunteers for 28 years, collecting data year-round at the Lomas Barbudal Monkey Project near Liberia, Costa Rica. 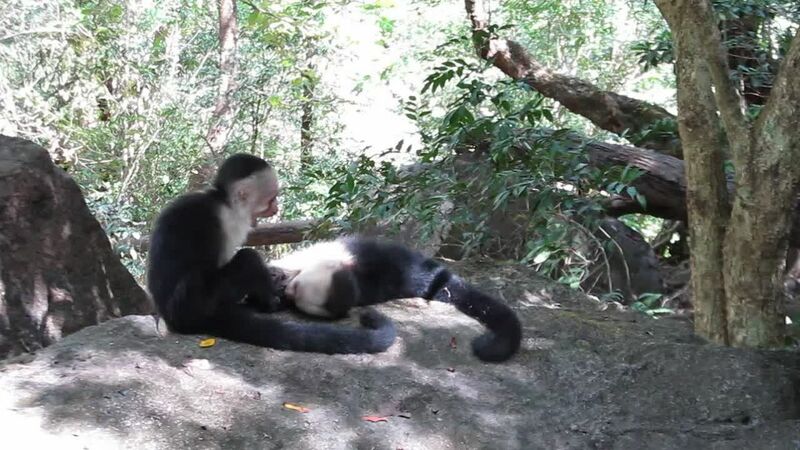 They track the daily activities of 234 individually recognized capuchins in 10 social groups, witnessing their play and foraging behaviors, documenting their conflicts, and observing how their familial structures function. The work can be physically grueling, climbing steep hills 13 hours/day in heat and humidity, visually tracking swift-moving monkeys in dense, thorny foliage. It’s also mentally taxing, requiring sharp attention to detail and an ability to quickly become adept at very specific data-gathering techniques. “This is not something everyone would want to do, or is able to do, even if they’d love to know more about the animals,” Perry said. To that end, Matt Zeigler, a former volunteer field assistant at Lomas, created the website HowtoBeAMonkey.org so the rest of us can get an idea of what it is like to witness and document the behavior of this remarkable species. The site follows a day in the life of a favorite capuchin named Winslow Homer, tracking his activities from a day when he was just nine months old. As the son of the alpha female in his group, he’s popular in the social group and a prime subject to illustrate interaction between monkeys. There’s a whole universe of primate behavior that teaches us about many aspects of their lives: intelligence, social behavior, foraging, predator/prey interactions, parenting, all of which inform our knowledge of evolution, the world around us and even our own humanity, Ziegler said. 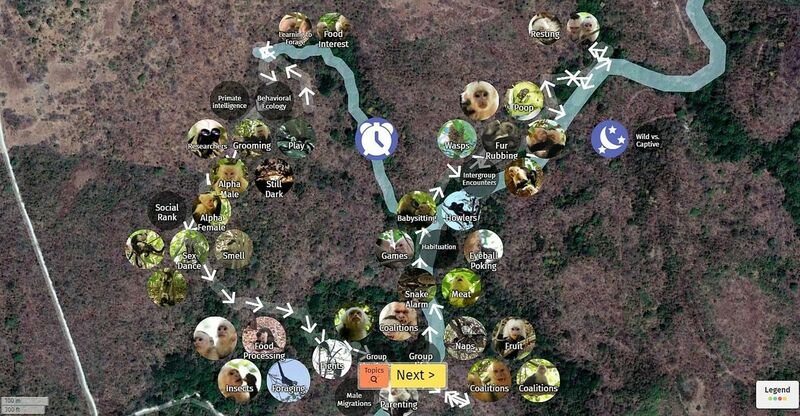 Map from howtobeamonkey.org that lets users follow a day-in-the-life of a capuchin monkey in the Costa Rican dry rainforest. The site is designed as an entry point for anyone who is curious about behavioral ecology in general and capuchins in particular, but Ziegler and Perry hope it will especially become a resource for teachers. A commitment to community education comes part and parcel with Perry’s ongoing research, especially in communities closest to the Lomas site. She works with nearby schools, visiting classes, showing them photos and telling them stories of the animals she and her team has observed over the years. 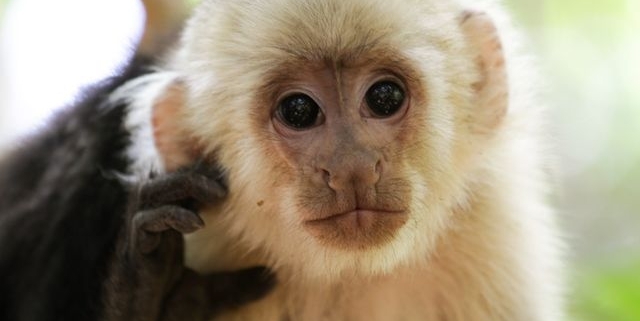 Over her nearly three decades there, Perry has found that sharing stories and images that highlight the individual personalities and idiosyncrasies of capuchins has been a driving force in helping the surrounding communities of humans appreciate and support efforts to protect the creature’s natural habitat and discourage poaching of them.